Today marks the end of Fairtrade fortnight and to celebrate, Holly and I have been using some of the gorgeous products from Organic Monkey who specialise in fairtrade and organic skincare products for babies. As big fans of the Organic Monkey cheek rub oil we were excited to try out some of the other fairtrade and organic products. 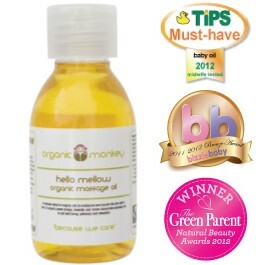 I was all the more excited when I realised that their signature baby massage oil is called "Hello Mellow Organic Massage Oil" ! These days Holly doesn't often stay still for long enough for me to massage her but occasionally when she is in the right mood to zone out I do still perform a little baby massage on her legs, chest and arms. This massage oil is a beautiful scent (although Organic Monkey do also make an unscented version) which is an uplifting mix of citrus with soothing chamomile and lavender. I found the mix of the oil to be quite light which means it is very easy to apply and you don't need to use very much of it. I thought the introduction of sweet orange oil was a great idea as it makes the scent that little bit out of the ordinary. All of the base ingredients that are farmed to make Organic Monkey's balms and oils are bought through fairtrade arrangements. We also tried out the Organic Monkey Bumfluff Nappy Balm. The blend of oils is quite similar, but without the citrus zing. The balm is made with a mix of essential oils and fairly-traded shea butter to help smooth and soften skin and is intended to prevent the conditions which encourage nappy rash. Holly suffers immensely from nappy rash so we tend to use a lot of nappy balm as a preventative measure. I would say that this balm didn't seem to prevent the rash but once it was there, it definitely soothed. Holly is beginning to be able to communicate with me and it is very clear when the nappy rash causes her pain... with the bumfluff balm she seems happy and comfortable. The nappy balm is very very light and once again you just need a thin film of it - I use the balm all over the bottom, not just in the areas which suffer from redness.